Have a little more space? This package is similar to the 3,770 but includes a separate shallow pool with a play center for children. Perfect for attracting visitors of all ages and room to host those ever popular birthday programs. 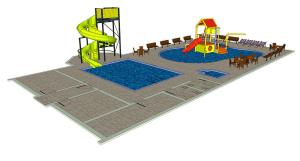 The 5570 model offers a squared off splash pool to provide space for those wishing to swim laps along with a separate play area for the children. The Super Squirt slide is the perfect slide to keep the kids busy climbing up the spiral staircase and sliding down an exciting enclosed slide and into the splash pool. The difference between 5570 A & B is the choice of a small play structure with a small slide, things to climb on and various spray areas or a more interactive spray park. 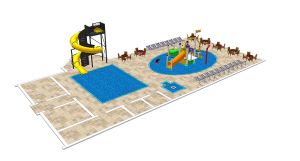 The layout provides two rooms off the waterpark that can be used as an exercise room or as party rooms for birthdays and family gatherings.